If you love traditional British tea then Robinsons Tea Room is your place. With more than 50 varieties of loose tea offered on their menu, from sweet to fruity and everything in between, you’ll love tasting your way through their options. All of their teas are served British style with a loose leaf diffuser in a beautiful teapot. Robinson’s also serves up delectable scones and quiches, finger sandwiches, salads and indulgently delicious baked goods. The perfect space, with a quaint and cozy environment for warming up with a cup of tea and your favorite pastry (we love their scones). Robsinon’s is open every day from 10:30 a.m.-4 p.m. Reservations are recommened. A twist on British tea, Swing the Teapot was thought up with its Irish roots in mind. The space gives guests an authentic, rustic tea house experience. 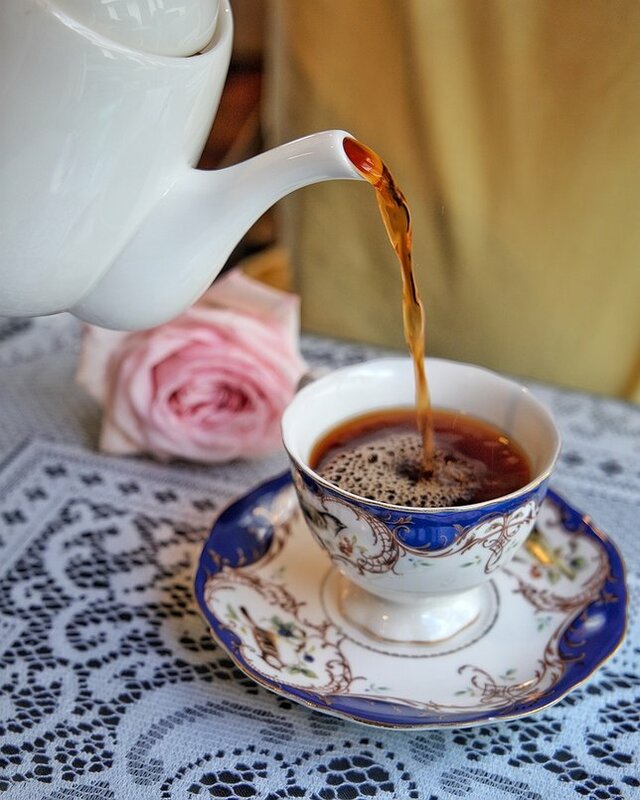 Choose from tons of options of tea, which is served in a traditional cast iron teapot. The rest of the menu has authentic Irish cuisine to compliment any tea choice. On the weekends, the intimate tea house turns into a late night spot with live music every Friday and Saturday starting at 9 p.m. Swing the Teapot is open Monday through Wednesday from 8 a.m.-4 p.m., Thursday 8 a.m.-9 p.m., Friday 8 a.m.-12 a.m., Saturday 8 a.m.-1 a.m. and Sunday 8 a.m.-4 p.m.
Classic and refined, the Secret Garden’s impressive loose leaf tea selection and tiered pastries (including their famous scones) will have you feeling like British royalty. They even offer guests feather boas and hats to dress up in for the complete high tea experience. Their lunch menu features everything from fresh salads like their Cranberry Walnut Chicken Salad to sandwiches like their Asian Turkey Wrap as well as a quiche of the day and homemade soups. The Secret Garden is open Monday, Friday and Saturday from 11 a.m.-4:30 p.m., Sunday 11 a.m.-3 p.m. and closed on Tuesdays andWednesday. Reservations are recommened. The starving Artist Cafe & Gallery is the perfect spot to enjoy great food and one-of-a-kind art. This hidden gem not only serves loose leaf tea in colorful teapots, but also showcases local artists and live music performances. Stop by for lunch with options like flatbreads to burgers and bites, or enjoy a night out with friends at their paint and sip nights, psychic nights and many other monthly events. The cafe is open Monday through Wednesday 12 p.m.-9 p.m., Thursday through Saturday 11 a.m.-10 p.m. and Sunday 12 p.m.-9 p.m. Chair Noir is the perfect space whether your looking for a superb croissant, high tea service or to celebrate a special occasion. With a menu serving lunch, dinner and high tea, there truly is something for everyone. The food is just as impressive as their tea with options as simple as fresh salads to mussel pots and frites and their Catch Du Maison (fresh fish of the day). Their tea selection changes frequently so be sure to get in your favorites while they’re around! Cat lover? If so, you’ll love sipping your tea amongst all of the kitty decor. Chat Noir is open Monday through Tuesday 9 a.m.-5 p.m., Thursday 9 a.m.-10 p.m., Friday through Saturday 9 a.m.-11 p.m., Sunday 9 a.m.-9 p.m. and closed on Wednesdays. Daddy! Those porta potties are GROSS! Subject: LongIsland.com - Your Name sent you Article details of "These Long Island Spots Are Serving Up Some Exceptional Tea"